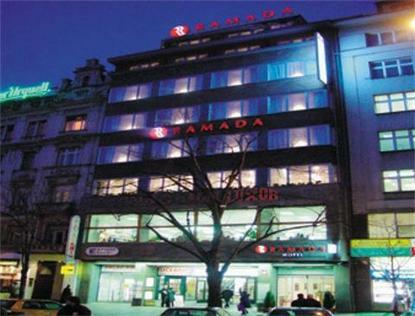 Situated on Wenceslas Square just a few steps from the most visited cultural and historical sights. Enjoy the real downtown location in PragueHotel disposes of 98 modern and elegant rooms including 9 apartments. All the rooms are air-conditioned and equipped with TV/SAT, telephone, minibar, safe and internet connection. Thanks to the central location, the hotel is ideal for business meetings, company training and conferences up to 50 participants. The direct public transport connection ensures maximum mobility within Prague and surrounding areas.The buffet breakfast offers wide selection of cold and hot meals with respect to regional preferences. Ramada Cafe-Bar invites all guests for refreshments all day long. Come and taste famous Czech beer, wines and spirits, international drinks and other specialties.Nearby Ramada World Class Fitness offers full-scale fitness programme on the area of 2000 m2 including sauna, pool and massage. Parking in the secured garage is managed by the hotel reception. These services are not included in the room charge. Parking charge CZK 650,-/day (EUR 25,-)Free Discount Vouchers for Cafes, Restaurants and Shops in Prague.Sightseeing and cultural ticketing available at the reception.Hotel has its own limousine service.